Start with your feet for total body comfort. Reduce strain and fatigue on legs, back and neck. 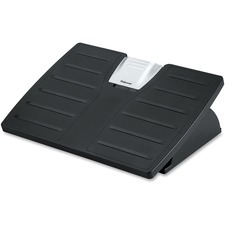 This models offer easy foot-controlled platform tilt adjustment and lifetime warranty to original purchaser. Features: Tilt adjustment, height adjustable, contoured 18" wide non-skid plastic platform with soft bumps to massage and soothe your feet, heavy-duty steel base.